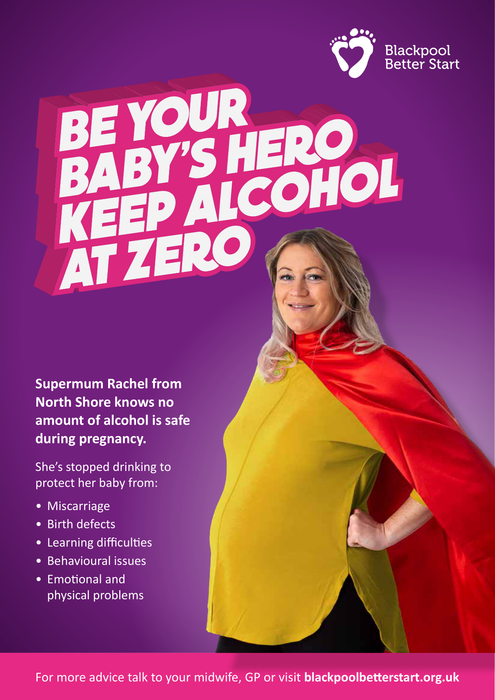 Blackpool Better Start's new public health campaign ‘Be Your Baby’s Hero, Keep Alcohol to Zero’, is raising awareness of the dangers of drinking during pregnancy! Our four superheroes represent the different people in an unborn baby’s life that have a collective responsibility for the health of that child. They will appear throughout the town on billboards, poster sites, phone kiosks and buses, as well as on social media! Commenting on what it is like to front the campaign, Supermum, Rachel Rossie, - whose third child is due later this month - said: “When I saw that Better Start were looking for people to star in this campaign I wasn’t sure whether I should apply, but when I realised what the campaign was about I wanted to do it because it’s an important message. It’s something different for the baby book too! The new 12 month campaign, launching on the 3rd November 2018, features a local mum, dad, nan and best friend dressed as superheroes and aims to reduce the number of alcohol exposed pregnancies in Blackpool. It has been created following recent research that shows harm caused by alcohol in Blackpool is significantly higher than that of the national average, and is amongst the highest in the country. Explaining the importance of the campaign, Dr Arif Rajpura, Director of Public Health at Blackpool Council said: “Blackpool Council as a partner in Blackpool Better Start, has worked with them to produce a new public health campaign to warn families of the impact of drinking alcohol during pregnancy. The campaign will tackle the number of alcohol exposed pregnancies in the town, and will raise awareness of the impact of alcohol consumption in pregnancy. We know that in the past messages surrounding ‘safe’ alcohol limits during pregnancy have been confusing, and this campaign has been created to clarify that there is no safe amount. Merle Davies, Director of Blackpool’s Centre for Early Child Development said: “We are incredibly excited to launch this campaign and hope that it has the intended impact of changing behaviour around drinking in pregnancy. We hope that using local people to champion the message of zero alcohol during pregnancy will resonate with the community and drive the message home more effectively.